The CBC has posted an interactive map based on the October 30 Toronto Police Report. The map is an interesting addition to the massive Rob Ford news coverage and raises a number of questions. Why might the CBC have created this map? How might the map increase traffic to and interest in CBC.CA? How does the map inform people’s awareness and understanding of the people and events described in the police report? How might the map influence people’s feelings about the mayor? How might Sandro Lisi or Rob Ford feel about a map that shows the locations of their homes and frequent haunts? 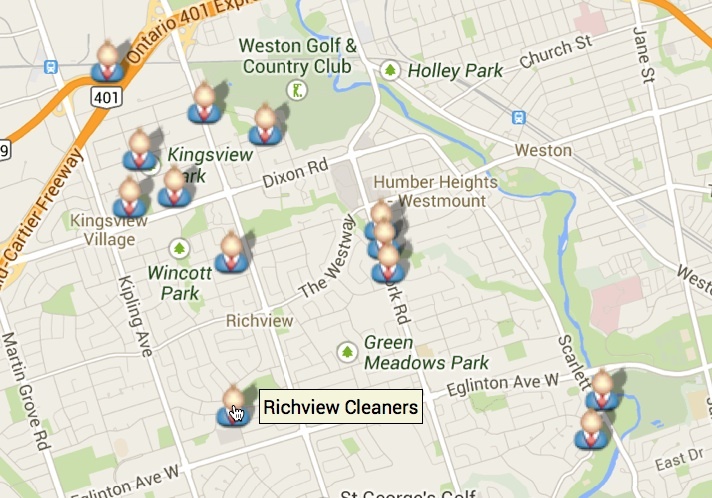 How might the owners of Richview Cleaners feel about their store’s location being included on a map with suspected crime sites? 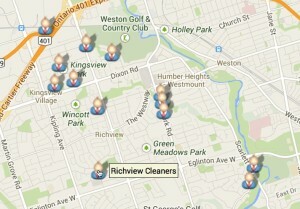 How might the inclusion of the location of Richview Cleaners affect the company’s dry cleaning business? The locations are indicated by faceless heads on torsos with suit jackets and red ties. What connections might people make between these icons and the mayor? What icons would YOU have designed? Might you have created different icons for different kinds of locations or used the same icon for all locations? Why? What questions does this map raise for you?